China’s recent history has provided fertile ground for artists, particularly those addressing a western audience. Li Tianbing’s new series of paintings focus particularly on autobiographical family history. Having grown up in China during the 1970s, the artist won a scholarship to study in Paris where he now continues to work. Taking rare photographic images as a child captured by his father on a borrowed camera, Li inserts these fragments of a wider national story into large photo-realist paintings that use his young image as a means of connecting the past to contemporary life . The photographs are reproduced as a direct quotation in black and white, softly overlaying more generic scenes of life in China, which produces a cinematographic effect of montage and fades. Amongst, the finely finished photographic surface, paint is sometimes applied in textured blobs or allowed to run down the surface as a contradiction to the appearance of mechanical reproduction. ‘Don’t Touch My Dog’ depicts the young Li holding an imaginary dog surrounded by invented friends. Communist Party street flyers are attached to a wire fence through which the children emerge. For Li, childhood is remembered as an experience of individual isolation and deprivation as a consequence of China’s introduction of a compulsory ‘one child’ policy. ‘Bullet Holes’ establishes a foregrounded, transparent screen damaged by fired guns through which we see two crouching infants looking back towards the viewer. An indeterminate air of menace shapes the narrative here. Many of these recent paintings also suggest repressed emotional trauma. In some works, Li places his childish alter-ego amongst western artistic activity. 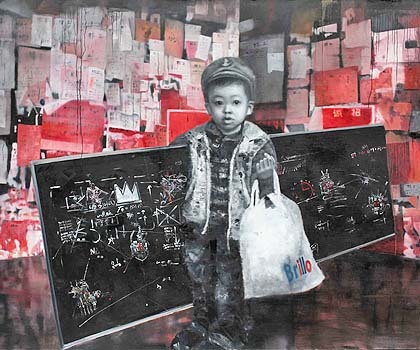 In ‘Return With Fruitful Results’ the infant Li appears to returning from a shopping trip carrying a long blackboard decorated with chalk motifs by Michel Basquiat and holding a plastic bag archly branded with Warhol’s appropriated ‘Brillo’ logo. This child anticipates his adult engagement in a wider cultural conversation, aligning his formative, Chinese origins with a more universal adult aspiration. This picture illustrates Li’s use of hybrid sources arising out of lived observation, fantasy, education and travel. While such eclectic references present inevitable problems of interpretation and complex hybridity, these paintings are tempered by unique memory and experience.